This is Part 3 in a series about growing garlic. Click here to read Part 1: Planting or Part 2: The Growing Season. 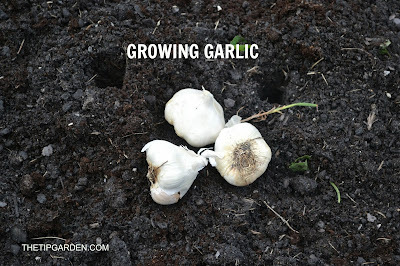 At this point it's early summer, your garlic has been growing well and you aren't sure when it's time to harvest or what to do with the garlic after you harvest. When the leaves begin to yellow and bend over it's time to harvest. That can be anywhere from mid-summer to September depending on your region. Do not pull the bulbs up by the stalks. You'll break off the stalk and not pull up the bulb. Using a garden trowel or pitch fork gently dig around the bulbs, but go deeper than the bulb. Hold the stalk with the other hand and gently lift the bulbs out of the ground. Bulbs bruise very easily, so if you accidently hit one with the shovel or pitch fork, put those bulbs to the side, you'll want to use those first after the harvest and drying steps are done. Do not knock the dirt off the bulbs by banging the bulbs together or on any surface. This will only damage the garlic. Leaving the dirt on, you'll need to dry the garlic. Many sources will tell you to lay the garlic out in the sun for a few days, other sources will tell you this will dry out your bulbs too much and too fast. In my climate is way too hot and humid to lay them outside. I will give you the "out of the sun" directions. The directions below come directly from the North Caroline State Cooperative Extension which is near my region of the country. Garlic likes to dry gradually to allow excess moisture in the roots and leaves evaporate or withdraw into the bulb. Wait until the roots and necks are completely dried and emit no typical garlic odor when cut; that is the time to trim it. It often takes three or four weeks to get to that stage, longer for large bulbs. 1. Tie them in bundles of 6-12 bulbs. 2. Hang the bulbs outside but out of direct sunlight for several day but can take up to 3-4 weeks. Until no more odor emits from the plant when you cut open a stalk, and the outside layers become papery and fragile. 3. Gently brush the dirt off the bulbs. 5. Trim the stalks if you don't wish to hang them during storage. 6. Store in a slightly cool (But not too cool) pantry or storage room. 7. Save your biggest and your best bulbs and replant them the following October! Jan's tip: Do not store in a closed container or bag. Keep them out in the open during storage.